Home > Safety > Mobile Phones Targeted at Toddlers? Older children, from the age of 7 or 8 commonly use mobile phones and mobiles are a necessary accessory for every young teen. However, more recently, several mobile phone companies have been targeting new ranges of mobile phones specifically at very young children. By designing the phone to look like a toy, children as young as three or four have been seen using mobile phones to make calls and send texts. The health risks associated with mobile phone use are the topic of a great deal of controversy. There is no proof either way but various studies are now being completed that look that the long-term impact of using a mobile phone excessively. This research takes several years to complete and it is only just providing results because mobile phones have only become very widespread since about 2001. Studies carried out over the last 5 to 7 years, collecting data on cancer risk mobile phone use are only just being published in peer reviewed journals. Over the next few years, more studies will publish their results and analysis of the evidence they provide will make it much easier to say whether using mobile phones does cause an increased risk of some types of cancer. In the meantime, parents face some difficult decisions. A new government report issued in the UK in the summer of 2009 cited recently published Scandinavian research that appears to show that long-term and regular mobile phone use leads to a higher incidence of benign tumours of the ear and brain. Excessive use is taken to mean using the mobile phone to make calls, with the ear piece up to the ear for several hours each day. The rate of tumours in adults who report using mobile phones the most is much higher than in adults who rarely make mobile phone calls. This is worrying enough but experts are very concerned that the developing tissues in young children would be even more badly affected by regular mobile phone use. Young children who start using mobile phones at a very early age could be at particular risk, even if they don't use their phones for literally hours each day. The actual impact of using a mobile phone for more than ten years has never been tested so we don't know the likely long-term health effects on very young children who begin using a mobile phone when they are under 5 years old. Most experts are advising parents not to introduce mobile phones into their children's lives this early. However, others warn that this question is going to be very difficult to resolve one way or the other unless we start to do long term studies of mobile phone use virtually from toddlers upwards. No studies of this type are yet in progress, so it may be 10 or 15 years before evidence-based advice can be given. Mobile phones have never been popular with schools because of the disruption that they can cause to lessons. Schools also find the rate of theft of newer mobile phones is high because having the latest models of phone in school provides an obvious temptation to children who don’t have them. Most schools ban mobile phones anyway but this latest report reinforces their stance and provides further evidence to exclude mobiles from school premises. Some schools now even the extreme step of installing mobile phone detectors that are used to 'discover' mobile phones hidden on pupils coming into school, in bags and in lockers. Once the phones are confiscated they are later returned via parents. Following the publication of the recent government report, several manufacturers of mobile phones specifically marketed towards younger children have withdrawn their mobile products from sale. But they have expressed their anger at what they label as 'scaremongering' on the basis of little firm evidence that mobile phones actually do harm. So Would You Let Your Child Have a Mobile Phone? The decision rests ultimately with individual parents but it seems sensible for very young children to avoid mobile phones, which are probably used only as toys. 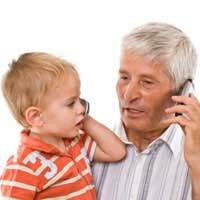 As children get older, the advantages of having a mobile phone to keep in touch and to contact parents increase, and perhaps the advice should be to encourage mobile ear pieces, either wired or wireless, to restrict the amount of time that the phone is held in place next to the ear.